I bought this Bob Dylan album from 1974 sometime between 1978 and 1981, not as a conscious decision for this particular item but because it was discounted. (At that time very few retailers discounted anything much – and certainly not for big-league artists like Dylan)! I know this because during this period I spent unhealthy amounts of time in every record store I passed, calculating what I could next afford. Honestly. I always think of it as a curiosity from the strange interregnum when Dylan left the Columbia/CBS/Sony label before realising that this rather corporate company actually did a pretty good job for him. In addition to ‘Planet Waves’, this period saw the live ‘Before the Flood’ appear on Asylum (in North America) and on Island Records (ILPS 9261) in the UK. In addition, it always seems to me to be both under-rated and overlooked given the proportion of strong songs it contains. 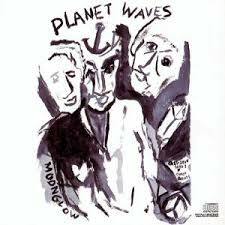 There are eleven tracks on ‘Planet Waves’ including what is probably the best-known (and most covered) song Forever Young, which appears in two versions. A slow version closes side one of the disc and a more jaunty one which opens side two. It’s a tender, warm, song from Dylan to his children and is one with which any parent can empathise. The first version (lasting nearly five minutes) is something of a dignified, hymn-like paternal blessing while the up-tempo, rockier version comes in at a little under three minutes. Both are great – and for anyone two likes understanding how a song takes shape, I’d also recommend a two-minute early demo take of the song which did not appear until 1985 (on the ‘Biograph’ collection). The familial theme continues in the album closer (Wedding Song) which is a love song – but one with typically Dylaneque twists of enigmatic ambiguity. If it’s not entirely an autobiographical song to his then-wife Sara, then there must certainly be some personal elements in it – and it’s performed by Dylan alone with his guitar and harmonica. Backing elsewhere on the album is provided by The Band – members of which are on top-form throughout – particularly on the more out-and-out rock ensemble pieces (like the opening track On A Night Like This and later on You Angel You). If you really mean it, it all comes around again. If Forever Young and Going, Going Gone are the stand out tracks, the understated gem is (and one of my Dylan favourites) is Never Say Goodbye. There are two reasons why I like this track. The first is a wonderfully melodic bass line from Rick Danko which introduces the song from 11 seconds in until the vocal begins at 26 seconds. I don’t quite know why but I just love it! I can’t articulate why, but it’s really evocative. I really don’t get why this album is so overlooked – perhaps the the austere cover. Anyhow, go listen!